In most parts of Toronto, space heating is the most sought after single component for home and office energy use. More than 75% of the homes have some form of heating and cooling systems to keep the space comfortable. It’s the remaining 25% that miss out on the advantages of having a HVAC system at home. Not willing to invest in a cutting-edge AC or furnace, such house owners are ideally looking for single components that not just fit their budget but also add ‘luxury’ value to their homes. If you fall in that 25 percent of the house owners or tenants who don’t own a heating and cooling system of any kind, this article is for you. Here are 4 things you should pick a HVAC system. According to the last census, close to nearly 70 percent Canadians own their dwellings. For Toronto and its suburban neighborhoods, the number of people owning the house falls to 58%. Therefore, it is important to consider your ownership before picking a furnace in Mississauga. Buying a new furnace and boiler is a very good investment considering their long term returns. However, if you are not willing to spend a big amount on new boiler installation, HVAC contractors in Toronto recommend rental units. If you live in city, opting for electric heating units is not a bad alternative to the regular gas-powered furnaces. In most cases, electric furnace installation is easier than the gas ones. There are two reasons for this. Firstly, the size of electric furnace is comparatively smaller than the gas versions. Secondly, the ductwork installations are far more complex and elaborate when it comes to the high-efficiency gas furnaces. Depending on the time for which you intend to run the HVAC units, the cost of fuel in the area and the building regulations, hiring the services of a furnace sale provider is a reasonably cost-effective alternative to buying HVAC units from showrooms directly. Your HVAC unit can perform optimally only when it is chosen for the game. If the capacity of the AC is smaller than that required to cool or condition the space, it will run dry most of the times. Inefficient cooling and conditioning has a significant impact on the operational costs of the HVAC. That’s why most prospective buyers steer clear of the idea of AC installations at home. HVAC contractors in Toronto offer extensive inspection services and demonstrations for different sized homes before the customer picks the single component for their homes and offices. Centralized heating and cooling systems are wonderful for large sized buildings. Offices often pitch ahead with centralized cooling and heating units. It requires elaborate vent and ductwork installation to ensure highest efficiency from the systems. In Canada, the government regulations require latest furnaces to meet the 92% Energy Star and AFUE rating. Top HVAC contractors in Toronto ensure that the customers get highest optimized efficiency from their furnace installations. 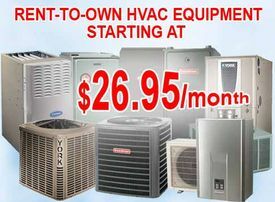 Apart from installations services, they also offer furnace sale opportunities to the owners of older HVAC units.